What’s the secret to making games? How did some of the mega apps like Angry Birds, Clash of Clans, Candy Crush and Minecraft climb their way to the top? Was it through raw innovation or blind luck? The answer might be surprising. They did what every major company from Hollywood movie studios to Ford Motor Company has done, they modeled and improved. The concept behind model and improve is very simple. A company first does research and identifies a very successful previous product in a related market. After studying the product, they figure out what they can improve and bring this new innovative product to market. For example, did you know that amazon.com was not the first book store on the internet? The first online book store was actually named Book Stacks Unlimited and owned the domain books.com. In the early days of the internet they had 500,000 books for sale and were delivering to hundreds of thousands to people around the globe each month. They were first successful e-commerce website ever launched. Amazon came along and decided now that the e-commerce was a proven market, they could beat Book Stacks Unlimited by modeling and improving. Not only did they offer a larger variety of books by brokering with publishers (Book Stacks was stocking every book sold where Amazon was not), they also implemented many never before seen innovations including suggestions feature based on purchases, one click checkout options and faster delivery service. Even more interesting, Jeff Bezos’ goal from the beginning was to create a store that sold everything “from a to z”, but he knew the path to success was to model what was already working and first conquer a small niche before branching out. Their growth was astounding and within 2 years they became the largest e-commerce site on the planet and today they generate more revenue than Google. Walmart wasn’t the first big box store, Meijer pioneered the superstore concept more than 20 years before Walmart opened their first super-center. The Graphical User Interface (GUI) concept, made famous by Microsoft Windows was originally created by Xerox. Henry Ford didn’t invent the automobile, band-aids didn’t create the first band-aid, and Kleenex didn’t invent the tissue paper. You would be hard pressed to find a popular product that didn’t supersede something less successful, but it should be noted, there is a huge difference between modeling and cloning. We do not endorse or encourage cloning of other people’s products in any way. With modeling and improving, you always want to try and improve what has already proven to be successful. Whether you’re launching a new product or making games, this method works. Using the model and improve technique when you’re making games will give you an advantage over other apps. This method is exactly what all four of the most well-known games on the app store did. Angry Birds sparked a global phenomenon and is often credited with kicking off the true forward movement of the app store. While it’s debatable if it was truly the game itself or just the timing, the significance of this game is so huge it’s hard to comprehend. Not only did Angry Birds lead apps into being the largest media category in the world (overtaking all of Hollywood in 2015), it also single-handedly created the video game merchandising space. Before Angry Birds there were no huge merchandising runs for games except for retro games to marginal niche markets. With all of these accolades, they had to invent the whole gameplay idea by themselves right? Actually no, they didn’t. They modeled — in some opinions too closely — a very popular flash game called Crush The Castle. While it is a similar game, they definitely did improve the original with better graphics, smoother gameplay and a much wider theme that would appeal to all ages. 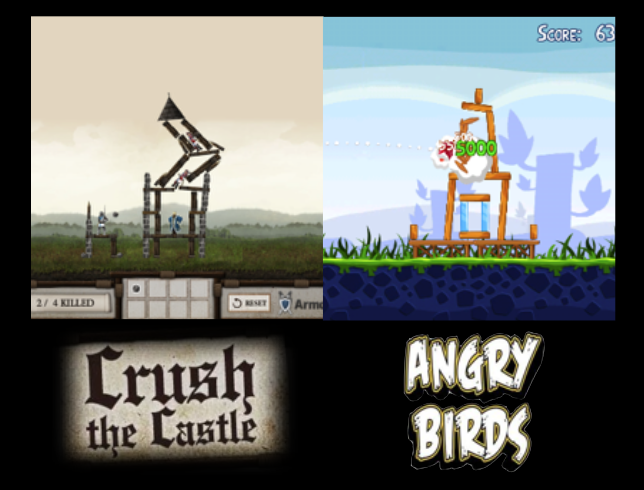 Crush The Castle predates Angry Birds by 6 months and was one of the most played flash games of all time. At the time of this writing they rank #4 on Armor Games with 25,699,831 plays. Now we know that Angry Birds closely modeled Crush the Castle, but what about the legendary app store ruler of grossing charts, Clash of Clans? As you might expect, they also closely modeled a game, but their story is a little different. Clash of Clans is created by Supercell. On their old website, you’ll notice 4 of the 6 founders were from a previous game company called Digital Chocolate. The founders all left Digital Chocolate to pursue their own game, Clash of Clans, and little did they know they were about to create one of the most valuable companies ever. Supercell grew from zero to a $3 billion valuation in just 3 years. That’s great, but where did they get the initial idea? The company they left, Digital Chocolate, happen to make a successful game called Galaxy Life. Not only does Galaxy Life look like Clash of Clans, it plays like Clash of Clans. The premise is exactly the same, you hold down your fort and attack the enemy’s fort. However it goes beyond that. It’s so similar the original Clash of Clans tutorial was nearly a scene for scene remake. So did they rip it off? No, they added in a lot of unique features including multiple villages, better multiplayer support and most importantly a better theme. As we’ll soon discuss, theme is extremely important to your game. Fantasy is one of the most popular themes ever in gaming and bugs are notoriously difficult to sell. They modeled and improved. They took a game they thought was good and made it even better. This is the key to making games. Possibly the best example in these games is Candy Crush. Candy Crush is based on the time tested and proven gameplay style called Match 3, but did they invent Match 3? Not even close. 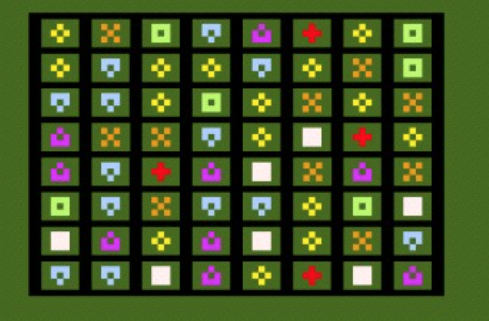 Match 3 games evolved from the more broader tile match gameplay type seen in everything from Tetris to Mahjong. So how long has tile matching games, and more specifically match 3, been around? Believe it or not, Match 3 style games are believed to have been around since the Roman times. It’s one of the oldest game design principles of humankind. It dates back to the creation of checkers, chess and backgammon. The first video game version of Match 3 was made in 1974 in Japan. It was called Doku-Go. Why did Candy Crush become so successful? It’s no secret wildly successful games such as Super Puzzle Fighter, Puzzle Quest, Bejeweled and countless others made popular games with the match 3 style years ago. And while they were all hit games, none of them came close to the global phenomenon of Candy Crush. Similar to Clash of Clans before them, Candy Crush came out with a new game based on a proven gameplay type and put an insane amount of focus on the theme. Candy, similar to Birds as we’ll soon discuss, is the ultimate theme. Everyone loves Candy including boys, girls, adults and children. It’s possibly the widest demographic known to mankind. Of course, they also created a very solid game with mountains of levels and carefully crafted gameplay mechanics. They definitely modeled what worked, but they spent years consistently improving until they reached perfection. Now, Minecraft made its beloved owner a billionaire and has completely taken over the lives of millions of kids across the universe. It was also heavily based on another popular game before it. The picture above is not of an alpha version of Minecraft. It’s from an open source game created by Zachary Barth called Infiniminer. 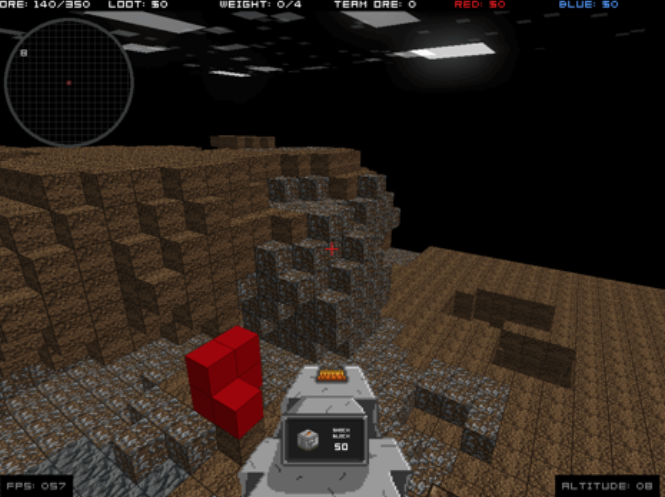 Minecraft creator, Markus Persson, has directly stated this is where his inspiration came from and that after playing Infiniminer he “decided it was the game he wanted to do”. Always remember when you’re making games to take time to really think of a great idea. Study other similar games and look for ways to model and improve. Picasso once said “Good artists copy, great artists steal”. Borrowing ideas from successful games should be mandatory when deciding your game idea. Try to respect the original creators and never copy, clone or reskin. Add something special to it. To do it correctly really breakdown the gameplay elements and then think of ways to improve each aspect. You’ll have an entirely new game that’s much better than before. Not only will it keep you out of hot water, it will also vastly increase your chances of success. This technique is the secret ingredient that all of the most successful game developers and entrepreneurs use. If making games is your goal, using the model and improve method is important. this is really amazing article, and i agree with you. innovation is great but everybody is not a innovator. Market trends make you good, and always relay on trends. wow… great share, thx Jonathan Trendel for giving itat to us.